Home / Advertising / 5 hands-on ways to jump-start your SEO, earlier to a site launch. Are you planning to launch a new website? Do you have a new idea or a new product in your mind? There are various steps you can take beforehand to confirm a smooth launch of your site. I know even if you are having all this you might hesitate to do SEO, until the site is live. Isn’t it? Actually doing SEO is not at all impossible rather it is a critical thing to be taken care of. Website owners always fail to do the pre-launch SEO which results in a poor index of the site. This results into the ignorance of their site by Google and the other search engines which makes the site buried deep somewhere. 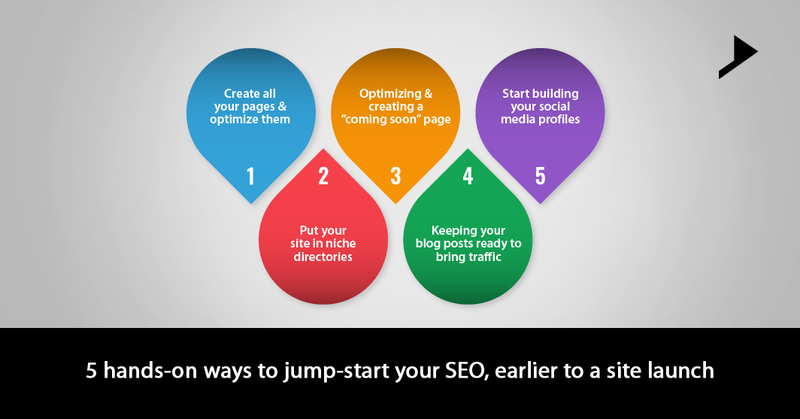 Here are the five smart ways to jump-start the SEO before launching your site. Older sites are given more authority. Just remember that it takes much time to get ranked by the search engines, so you have to start doing it with the “coming soon page” so as to cut down the wait time after the launch.Your coming soon page can be a huge source of getting leads and for this you can include a call to action button and entice the visitors to fill out the lead form by providing them a guide or a video or an entry in a giveaway. You can keep adding to this leads list and cherish them throughout the process of site creation.You can build your brand with this page as you can express any of the information on your page in the brand’s voice. Start connecting with your users, even if your site is not launched. This can be easily done by connecting your coming soon page to your social media presence. Create buzz with the help of growing social media circle. Let everyone know that something very big is coming soon. Showcase the press mentions so that it becomes easier for the press to get in touch with you. An attractive and easy to access media kit of the coming soon page should include all the basics about your website and the business. In your press kit, don’t forget to include logos, contacts, your mission statement, an FAQ section and a summary of media coverage to date. It is really important to start building up your social media community before your site gets launched. This will help you to make sure that there is a large number of following, who are interested in your business. You have to foster the trust of your audience in your brand by making them engage in the relevant social media platforms and sharing great piece of contents. Complete your profiles on different platforms including Facebook, Twitter, LinkedIn, Google+ etc. to target your audience. Connect all your profiles with the coming soon page to make it simple for the people to follow your social media presence. To bring traffic to your site you need well optimized, high quality and well-informed content even when it’s still new to the audience. Before the launch you have to keep your healthy contents ready for your site. Long content can help the web crawlers to identify your site and index it in a right way. Pre-Launch announcements, continuous adding of the fresh content can be possible if you start a blog pre-launch. A very critical step before the launch of your site is to start putting it in the niche directories which simply lists sites and the businesses according to the categories to which they belong. If your website gets listed in the right ones before the launch, you will have a built in authority to your coming soon page. Create multiple pages within your site and optimize them including long form keywords that will be used by the visitors. Make each of the page more useful and focused rather than reinventing the same pages. Use long tail keywords in particular, for your site to work on every page. Make sure your pages are optimized for every possible aspect of the business before it gets launched. The time following your launch is the most crucial for your business and its success. This is the moment you have to monitor the traffic and assess the results with metrics. Make sure to have an exceptional launch strategy. This will be the time to really hustle. There are many websites launched regularly, but in an unoptimized way. Although if you need to stand out of the crowd, you have to do it in the right manner and yes of course, don’t forget to optimize your site. If you are new to the online world please make sure to work with someone who is experienced so that you can have a successful pre- launch strategy.